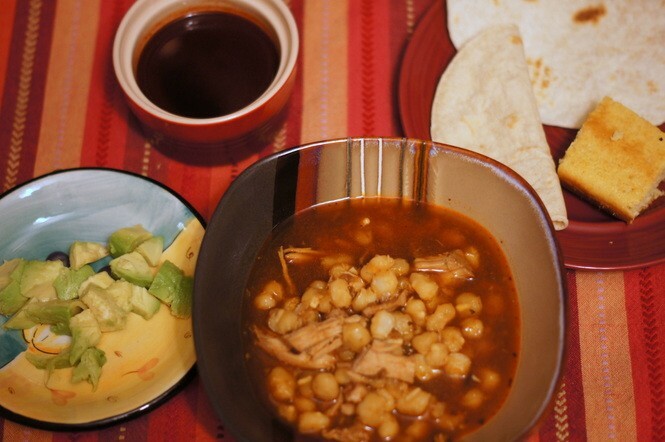 During the Christmas holiday season in New Mexico, a southwestern hominy stew called posole (or pozole) is a popular celebratory meal. Of course, I like it anytime. Probably the best posole I've ever tasted was at Hell's Backbone Grill in Boulder, Utah. 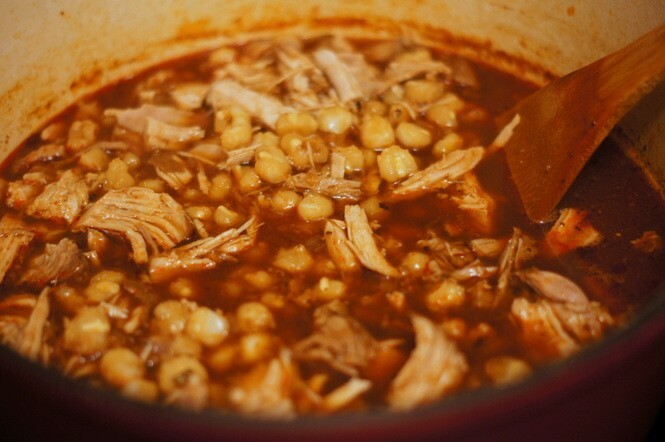 Co-owner Jen Castle grew up in New Mexico and knows a thing or two about posole! While mine doesn't compare with Jen's, I think my posole is pretty darn good. 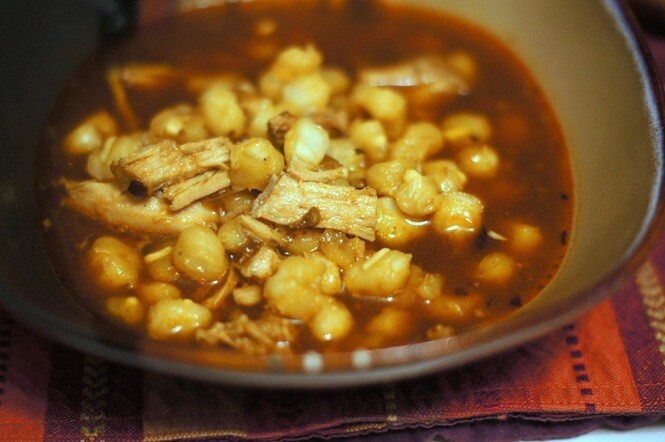 There are few things I like better than a warming bowl of posole on a chilly winter day. 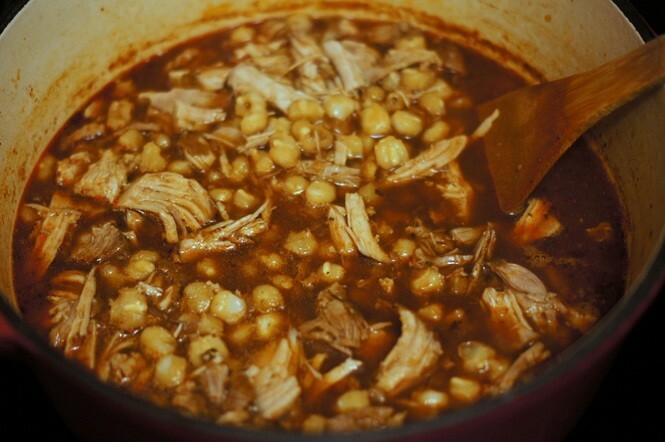 I use pork as the main protein in my posole, which is traditional. 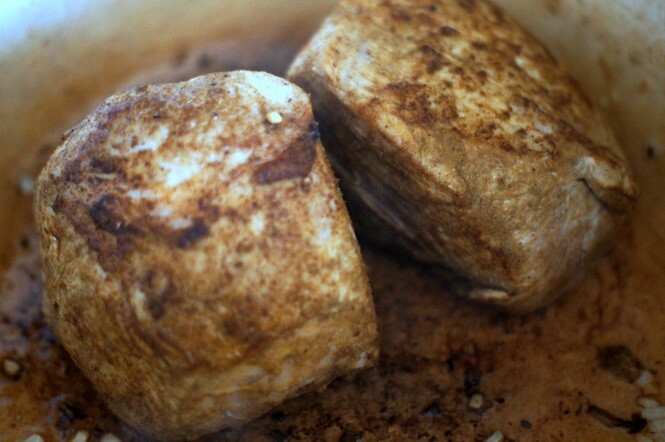 However, you could substitute beef, chicken, turkey, lamb, goat, or even veggies or tofu. I was at a restaurant recently where shrimp were incorporated into the posole. Note that the cooking time for this recipe is about 4-5 hours. However, most of that time is unattended. 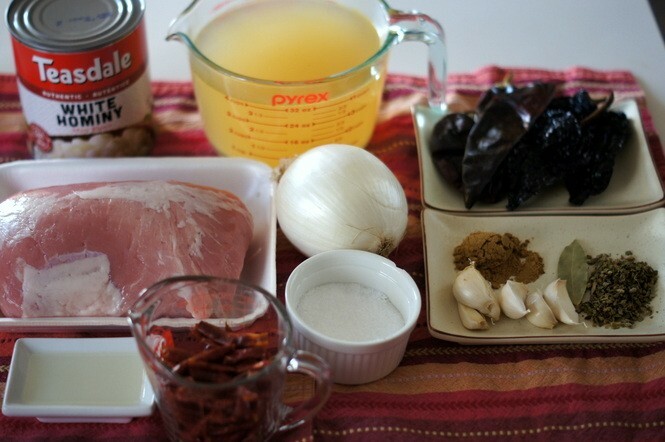 First you'll make the red chile base for the posole. Break the stems off of the dried chiles and shake out and discard as many seeds as possible. 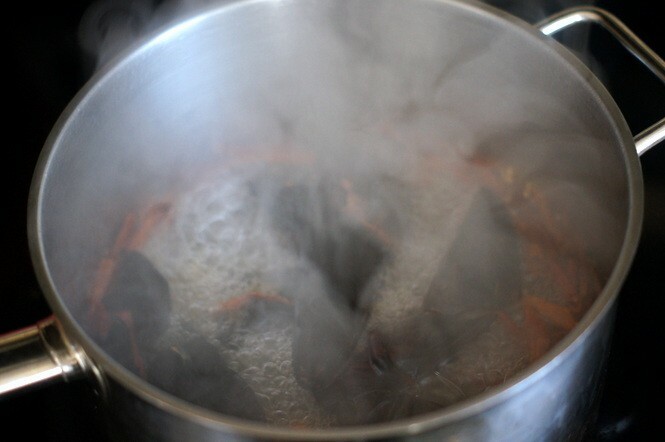 Bring a saucepan with enough water to cover the dried chiles to a boil. 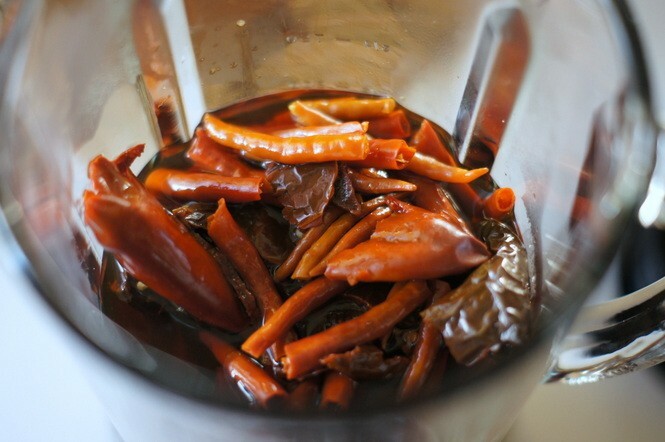 Turn off the heat and add the dried chiles to the hot water to soak. I place a saucer or pot lid smaller than the saucepan on top of the chiles to keep them submerged in the water. Soak the chiles until soft, about a half and hour. 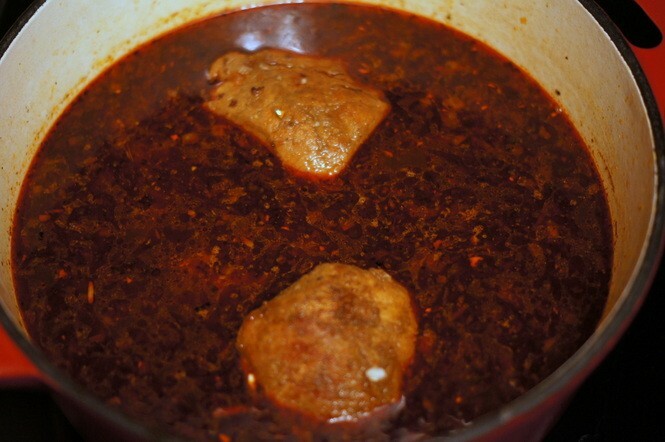 Put the softened chiles, along with 1 1/2 cups of the soaking liquid and 1/2 tsp. 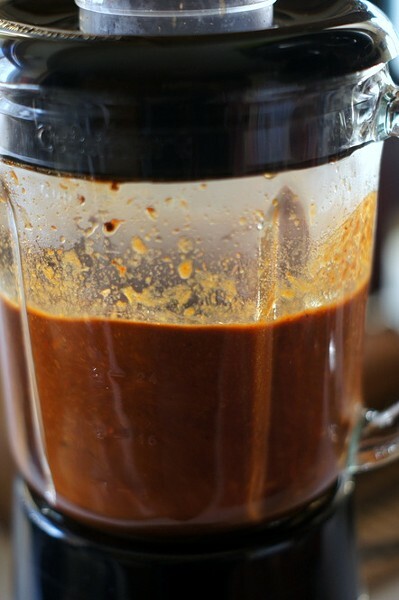 salt into a blender or food processor and blend until smooth and there are no large chunks of chile left. 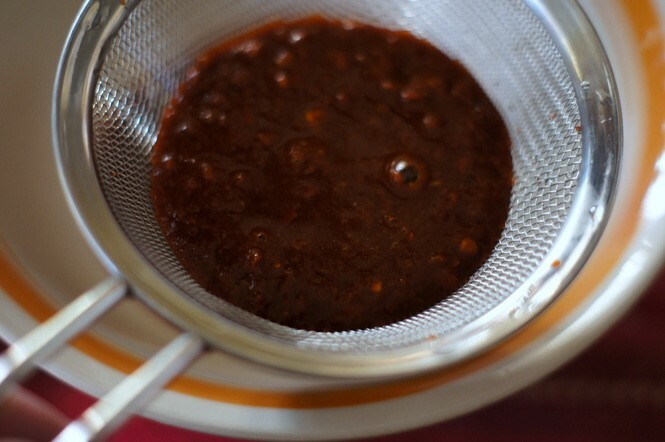 Using a sieve, strain the chile sauce into a bowl. 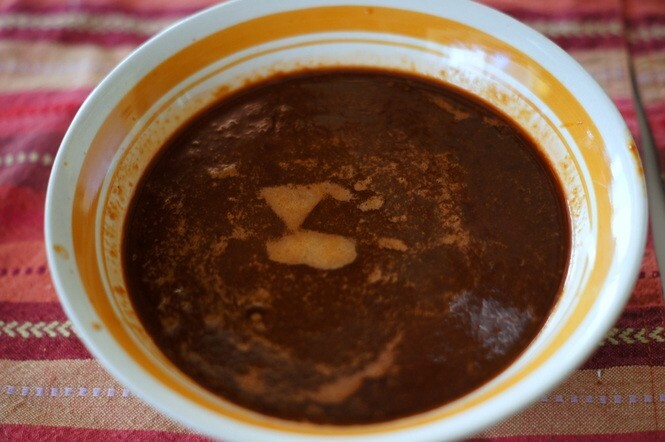 Use a spatula or wooden spoon to push the sauce through the sieve and discard the solids. 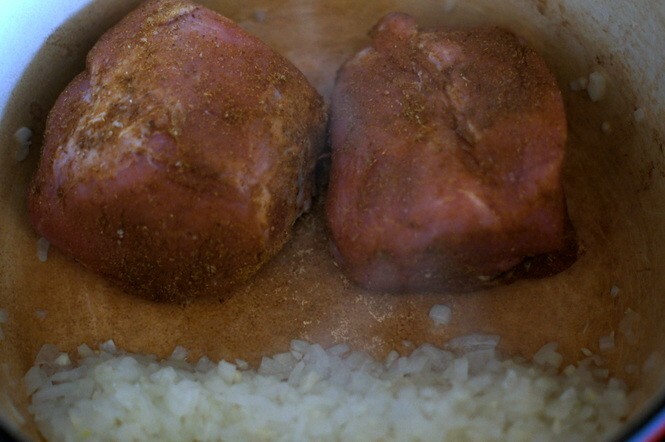 Rub the pork on all sides with 1/2 tsp. salt and the ground cumin. 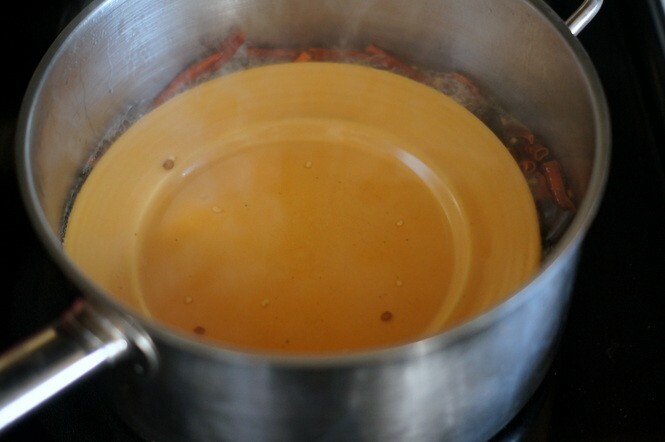 Heat the cooking oil in a large Dutch oven or stock pot over medium heat. 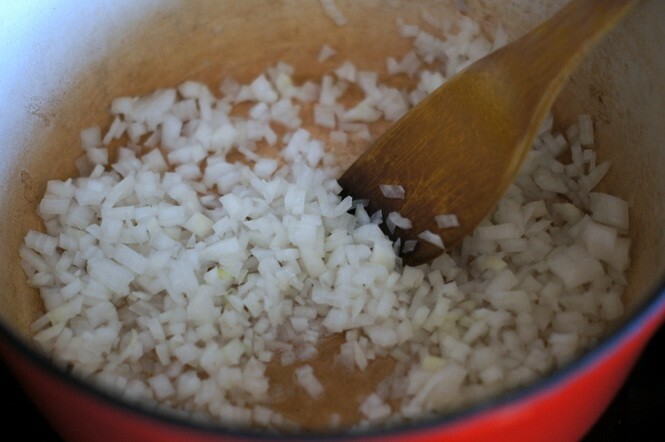 Add the onion and cook, stirring, until wilted, about 3-4 minutes. Push the onions to one side of the Dutch oven and add the pork pieces. 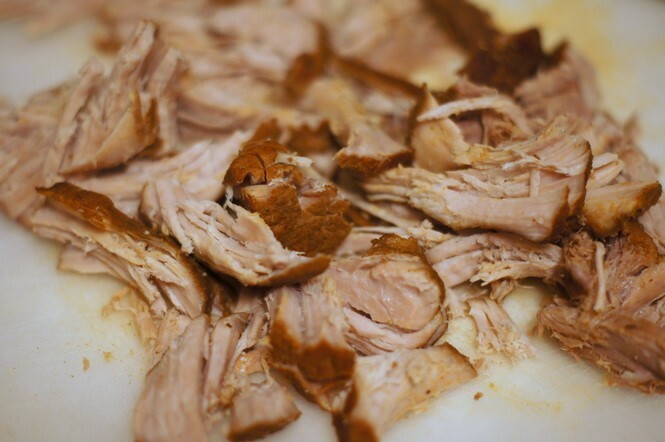 Brown the pork on all sides, about five minutes. 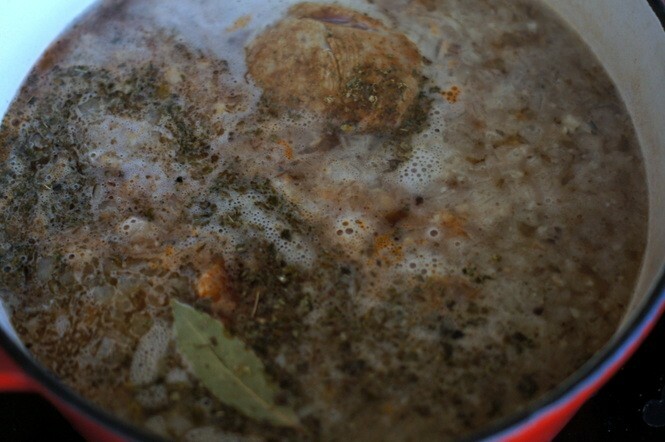 Add the chicken broth, 2 cups of water, the bay leaf, oregano, and 3/4 cups of the chile sauce to the pot and give it a good stir. 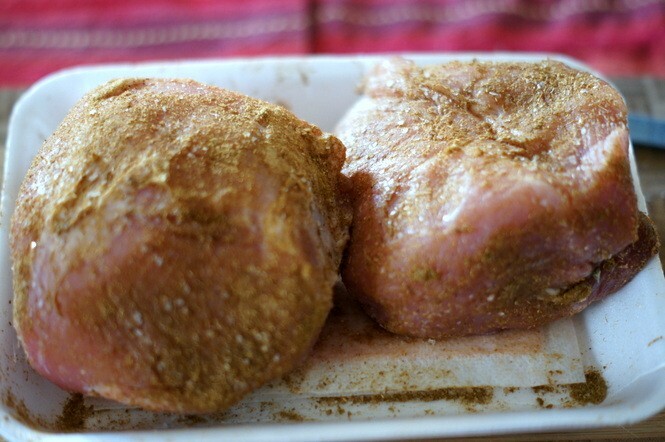 Cook at a simmer, partially covered, turning the pork occasionally, until the pork is tender, about 3 hours. Add the hominy to the Dutch oven and stir. Continue to simmer for another hour. At this point, the pork should be almost falling apart. Remove and discard the bay leaf. 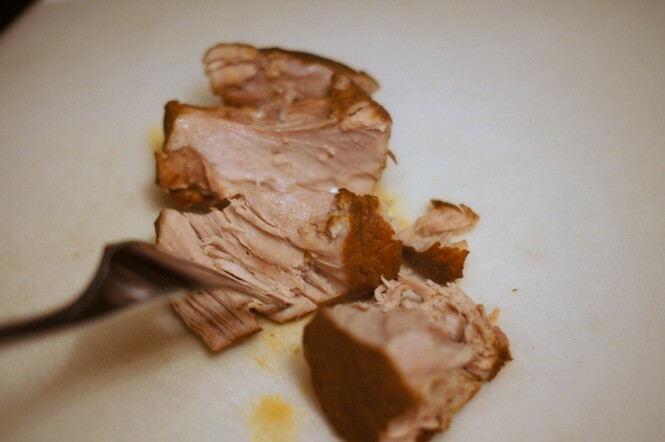 Transfer the pork to a cutting board and roughly chop or shred it. Return the pork to the pot. 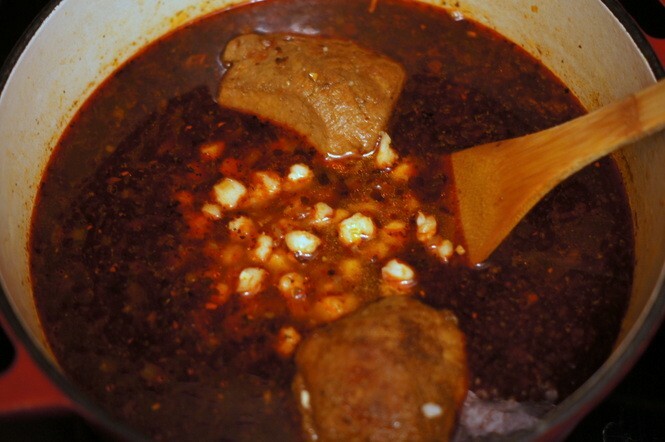 If the posole is too thick, add a little water. Taste and season with additional salt, if needed. Posole is traditionally served with warm tortillas, shredded cabbage, minced onion, sliced radishes, diced avocado, additional oregano, and fresh cilantro, for topping.